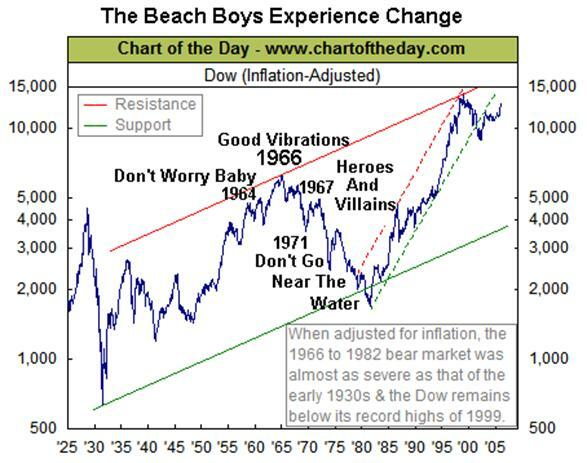 Just compare the image of the Beach Boys of the early 60’s to their appearance in the single “Don’t Go Near The Water” produced in 1971. The later single comes from the album Surf’s Up. Oddly, the artwork of that album depicts the End of The Trail by James Earle Fraser. This kind of ragged exhaustion is laughable now, but remember we aren’t down in the depths quite yet. Clearly the downward shift in social mood, as evidenced by the inflation adjusted Dow Jones Industrial Average (chart above updated to 2005), had made an impact. “Consider what it means to live through our times in the light of (Ed Note: Austrian or Psychological) economic understanding. Even in the face of calamity, there is no mystery and hence fear is reduced…In many ways, it is like watching the movement of stars and planets with the scientific knowledge provided by astronomy, or observing the effects of a plague with medical knowledge…Without the understanding, the events look mysterious, like a curse from the gods, and their patterns appear random. With the knowledge, with the understanding, we can make sense of the events. Patterns of cause and effect emerge. You see events before they happen, like turning the page of a script before the movie catches up to you. This gives you a sense of intellectual coherence and inner peace – even in the midst of calamity.” - Lew Rockwell, Money and Our Future. It is pretty obvious to most that we are in the deflationary spiral forecast last May. But Hope remains that President Obama will be able to turn the tide. Unfortunately for us all, Mr. Obama is relying on flawed economic theory that can only produce a political response and a temporary respite. The U.S. government must borrow to finance any bailout. Up until recently that has not been a problem. But if you read our report from last month, you will know that we expect a bursting of the government bond bubble as happened in the 1930s. Fear has halted housing, frozen credit, sold off stock markets, busted commodities and now its focus is turning to the government bond market. A tsunami will soon reach Washington. Levees by the Lincoln Memorial, March 1936. Why is this important? Mortgage rates are dependent on long term inflation expectations (long term bond yields). Higher government rates elevate mortgage rates. So more financed government money printing creates higher mortgage rates and more foreclosures. The government is reinforcing the downward spiral. To prevent the rise in rates, the Fed has recently announced that it may buy government bonds to cap yields. The Fed attempted this scheme before between 1961 and 1965. It was dubbed “Operation Twist.” As you can see from the chart below (from A History of Interest Rates, Homer and Sylla. ), the Fed was unsuccessful in pushing yields lower. When they finally abandoned the policy, rates soared upward from 4 to 14% in 1980. Here we are 2 years later with roughly a 40% decline in the stock market. And after all this the 5 top Wall Street strategists predict double digit percentage gains for 2009. Their reasoning? Markets go up after they go down. Sure, we could have a multi-month bounce in 2009. But remember optimistic consensus is the fuel for bear markets. Tech stocks didn’t bottom out until folks had thrown in the towel. We await their surrender. Holding cash is therefore still advised until asset prices fall to historically cheap valuations. If you would like to invest (there really is no need to, since inflation is NOT eroding the purchasing power of your savings), please contact us for carefully selected bear market trades. “…boom and bust cycles – the opportunity to pick up cheap assets (real estate, shares, bonds, etc.) will arise time and again during periods of crisis and economic downturns. Conversely, if investors purchase assets during boom times and during investment manias and hold on to these assets, they will either tend to perform poorly or lose money altogether, because once a boom comes to an end, a bust and then a period of underperformance follows, as the object of the boom and the mania tend to change over time. In other words, a boom in one sector of the economy is most unlikely to be followed by another boom in the same sector.” – Dr. Marc Faber, Tomorrow’s Gold. We would like to recommend to all of our readers Russell Napier’s Anatomy of A Bear: Lessons From Wall Street’s Four Great Bottoms. His analysis suggests we may have another 55% decline in the S&P by 2014. How could that much more downside in the market be realized? “There was some signs of economic stability in early 1931, but this resulted in only a modest rally in the equity market…Even at this stage, the magnitude of the decline in the index was only marginally in excess of the 1907 and the 1919-1921 bear markets. It was now that the second bank crisis hit. An investor committing funds to equities on Feb 24, 1931, almost 16 months after the October 1929 crash, would witness a 79% drop in the DJIA in the next 17 months. It was this period of decline that marked out the bear market as clearly different from anything before.” - Russell Napier, Anatomy of The Bear. “In 1929, the Bodenkreditanstalt (the ‘monarch of Austrian industry’ according to Rudolf Notel, “Money, Banking and Industry in Interwar Austria and Hungary”) was fused overnight with the Creditanstalt. The Bodenkreditanstalt brought to the Creditanstalt large loans to industrial concerns which could be maintained only by the device of ignoring market values…When the Creditanstalt took over the Bodenkreditanstalt, it acquired 80 million shillings of capital. But it also acquired 140 million of accumulated losses, as it learned later when a British chartered accountant revealed the truth…the announcement of the support operation on May 11, 1931 started a run, partly foreign, partly Austrian.” - Charles Kindleberger, The World In Depression: 1929-1939. Weaker banks have been rescued by stronger banks all over the globe. So far, Bank of America has already been surprised by losses from its Merrill Lynch merger. Others are sure to follow. Today’s list of largest U.S. corporations by market value (excluding financials) are: Exxon Mobil, General Electric, Microsoft, AT&T, Procter and Gamble, and Wal-Mart. In our next report, we will describe how and why these companies were able to dominate in the Great Depression.